Last Saturday, Mark ‘Fightshark’ Miller returns to the fight game at the Ultimate Glory World kickboxing event in Moscow. But other than his return after five years of being on the sideline, it’s the almost foot-long scar at the center of his chest that tells a bigger story. Getting inside the ring to meet Nikolaj Falin last Saturday, Mark Miller was the first known professional fighter to make a comeback after undergoing open-heart surgery. Back in 2006, when Fightshark was applying for a license in Florida, his echo cardiogram went back with some red flags. According to a cardiologist, his inborn congenital heart defect had finally caught up to him, and it requires surgery. But despite all that, Mark Miller’s focus was on finding a way to fight again. 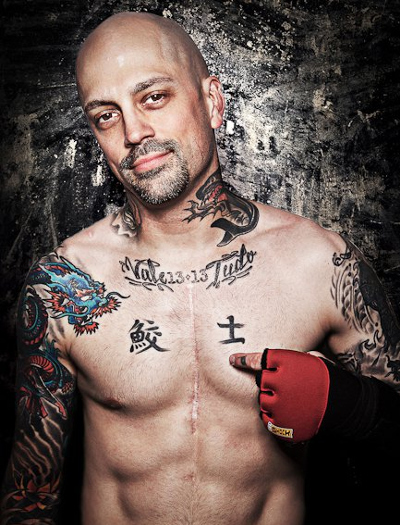 Following his surgery in 2007, Mark ‘Fightshark’ Miller was told that it would likely take a year before he can get back inside the ring. That is if he was cleared. Mark Miller was instructed to wait 12 weeks before doing any training, so he waited a week more than what was prescribed. Then his father died, followed by his mother a month later. And two months after that, his brother died and his marriage fell apart. Then he also underwent a knee surgery. No one would have blamed him of giving up, but Mark Miller is still intent on coming back. He even insisted that returning in active competition – no matter what – was his beacon. Fightshark spent some time training in Las Vegas, and has openly talked about his fast-living problems. Now that he’s taking his life ‘on the program’ one day at a time, Mark Miller has been training with renowned striking coaches, Rob Kaman and Buddy McGirt. He said that the doctors have cleared him, and the he has surpassed his personal tests, to let himself geared up for a return. Besides, Mark Miller said that he wouldn’t fight if he thinks that it will bring his three sons in jeopardy. Mark ‘Fightshark’ Miller said that he’s open for a MMA return if the right fight comes along. But he believes that he has a lot of near-term opportunities in kickboxing as of the moment. He also pointed out that this is a real comeback. He is not out to prove that he can step inside the ring once again, then hang up the gloves. I appreciate you using my photo of Mark Miller, however if you’re going to crop out my logo, at least credit “John Remus III/johnremus.com” as this is a copyrighted image.